A “Grand Bargain” of budget cuts and entitlement and tax reforms is back in the news again, for one simple reason: Some of the lawmakers who supported a long-term blueprint for slowing the rate of growth of the $17.9 trillion national debt are facing negative political fallout in this midterm campaign season for the stand they took. The “Grand Bargain” is surprisingly front-and-center in Georgia, Florida and a few other states. Democrats who embraced the “Simpson-Bowles” deficit-reduction plan are being hammered by Republicans for trimming Social Security and other entitlements. It is a brazen campaign tactic by the GOP, which has long endorsed entitlement reform – including reductions in Social Security benefits to control the nation’s long-term debt. While the reality of a Grand Bargain seems dead for now, it does remain a hot topic of debate among deficit hawks, conservatives and liberal thinkers. The National Commission on Fiscal Responsibility and Reform, headed by Alan K. Simpson, a former GOP senator, and by Erskine Bowles, a Democrat, was tasked by President Obama during the economic crisis with finding a solution to the rising debt of more than $1 trillion a year. The panel’s recommendations, issued in December 2010, were highly controversial at the time and still are. They included reducing Social Security benefits for wealthier Americans, raising the retirement age to 69 by 2075, and hiking taxes by overhauling the federal tax code. Virtually overnight, the Simpson-Bowles plan became a touchstone for deficit hawks and government reformers seeking to put the federal government’s spending on a more sustainable path. It also became a huge target of liberals and senior citizens groups who viewed it as a flagrant assault on the poor and the elderly. The one serious effort by President Obama and House Speaker John Boehner (R-OH) to construct a broad budget deal collapsed in acrimony in the summer of 2011. Congress subsequently enacted the Budget Control Act, including budget caps and automatic spending cuts known as a sequester – and a “fiscal cliff” deal in January 2013, which cut more spending and raised more taxes. More recently, as the economy continued to improve, health care spending declined and the annual budget deficit dropped to $483 billion in fiscal 2014, the air went out of the balloon in Washington for long-term deficit reduction. 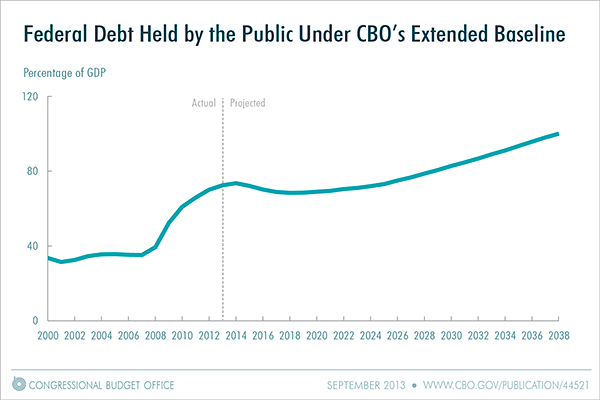 The non-partisan Congressional Budget Office has repeatedly warned of serious problems posed by the long-term debt, as health care costs begin to escalate to serve an aging population. For now, however, the administration and liberal Democrats insist resources should go for investing in infrastructure and other projects to create new jobs and keep the economic recovery going. Now, with renewed controversy over a “Grand Bargain,” Bowles this week issued a new public defense of his approach. A former Clinton-era White House chief of staff and co-founder of the Campaign to Fix the Debt, Bowles wrote in an op-ed in USA Today that the government doesn’t need to abandon debt reduction to make “smart investments” in the economy. “Unless we deal with our debt, the growth of spending on entitlement programs and interest on our debt will leave fewer resources to invest in our future,” he wrote. America is and will continue to be constrained from pursuing dynamic economic growth opportunities and from making smart investments in the future until we put our budget on a fiscally sustainable course. The temporary factors related to the recession – which caused the deficit to increase dramatically – are now receding, but the structural problems with our budget remain. Congress and the administration have taken some actions to reduce the deficit… [But they’ve] avoided acting on the tough stuff. As a result, the economy limps forward, and the deficit is projected to return to an upward path… We do not need to abandon debt reduction in order to make the smart investments necessary to compete in a knowledge-based global economy. Read more of Bowles’ comments here. Our deficit hysteria has calmed for good reason – there is no near-term deficit problem… Actual and projected budget deficits have fallen by $2.2 trillion over the 2011–2020 window, compared to the baseline the fiscal commission was working with – even with no bipartisan grand bargain over the budget. How has this happened? A mix of poor policy choices and good fiscal news has given our budget some fiscal breathing room. Read more of Smith’s comments here.